Already a Member? Check your points here! *Effective June 1st 2018, Heavenly Rewards Members now earn $20 for every 200 points accumulated. Guests can redeem a single reward $20 or double reward $40 towards their dining bill. Any unused monies are forfeited. Heavenly Rewards members that have $10 reward credits in their que will be able to combine (2) two rewards equal to $20. In order to receive points, please present your HEAVENLY REWARDS card to your server at the time of purchase. One point will be earned for every dollar spent. Only the guest paying the bill is eligible to receive points for that transaction. Private events contracted through a special event coordinator are not eligible for Heavenly Rewards. Each time you reach 200 points, the 200 points will automatically be debited from your Current Point Balance and converted into $20 credit on your card. There is no certificate; the credit is applied directly to your bill of equal or greater value of $20. Credits are applied up to two at a time. If multiple credits are earned then they will remain in queue until your next visit. Earned credits cannot be used towards taxes or gratuity, private dining events or purchase of gift cards. In an effort to preserve the integrity of our loyalty program, proof of identification may be required. 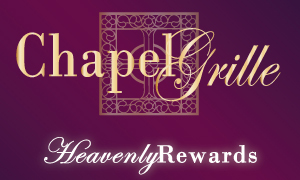 The HEAVENLY REWARDS program may change or be canceled without prior notice.